While we were dining at the Mountain Room at Yosemite Lodge the night before, Robert and I were discussing options for the day's outing. KP Pinnacle and the Ledge route on Leaning Tower were the two front-running options, but in the end we settled on Lower Cathedral Spire. I had failed miserably on Higher Cathedral Spire the previous day and was a little concerned that I might struggle on its lower cousin as well. 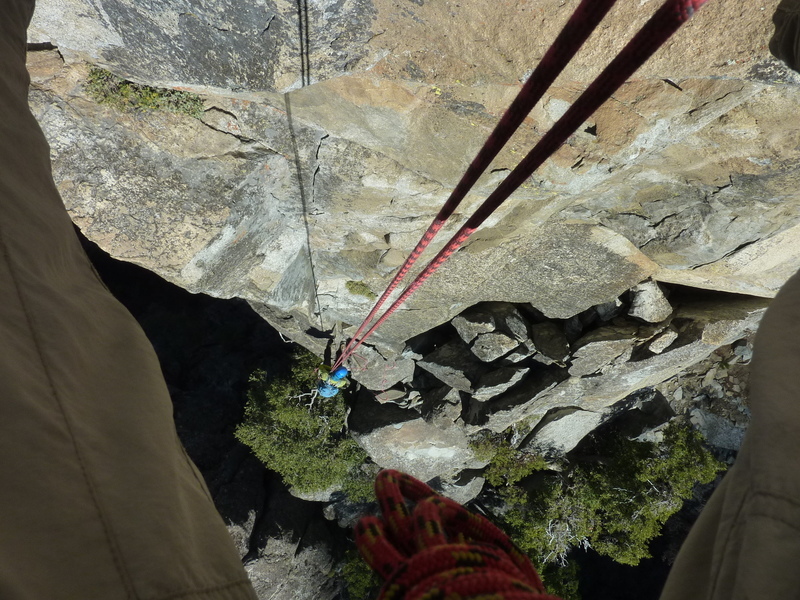 The climbing in general is much easier, however, save for a single 5.9 move that can be aided and I had a grand time on this Yosemite Valley classic. Props to Robert for carrying most of the gear and leading all the pitches. This was definitely one of my highlights for the year. LCS's Regular Route starts on the same side as that for Church Tower which we'd just done, in the gully southeast of the buttress on which the formations lie. You'd think this would have made it a snap for us to find our way to the start as we left the TH by leadlamp, but alas, it did not. When it was finally light enough for us to make out the towering cliffs and formations above us, we were confused when things did not appear as we expected. It soon dawned on us that we'd followed the climbers' trail up the gully on the northwest side of the buttress, the route used for HCS. This would cost us about 45min's time in descending back down the gully, around the toe of Church Tower and then back up the southeast gully. Even though we had started out shortly after 6a, it was almost 8a by the time we'd found our way to the base of the notch between the two spires and the start of the route, a short distance to the right (east), marked by a duck. We set up shop here, changing into climbing shoes, harnesses and helmets before Robert was ready to start up 15min later. The first pitch, 5.6, goes up a couple of large steps in a corner heading east, supposedly to a large, ant-infested tree. Robert looked around but found no large tree, nor any sign of ants - a good thing, really. This caused some minor confusion, but in hindsight I think it was because we did the lower part of the route to Main Ledge in three pitches instead of the usual two. We probably went right by said tree without recognizing it. The second pitch went up and slightly left (is that the large tree in the background? ), with the third pitch continuing up to the left side of Main Ledge where the Regular Route and South by Southwest split. We found a decent bivy spot on Main Ledge just above the top of the third pitch, pausing here to take a break, snack, watch the chipmunks run around and take in the impressive views. Afterwards we walked along the ledge to the right, finding it not exactly ledge-like, but soon scrambling to the end where a 50-foot drop marks the start of the next rope pitch and the crux of the climb. A sling hangs from a bolt just within reach from the ledge's end, the obvious A0 help needed if one can't free this move. Robert clipped a biner and the rope into the hanger before attempting the delicate move. It looked to me like an utterly impossible move, hanging on vertical rock without a decent hold to be found. Robert believed otherwise, at least at first, figuring a 5.9 rating meant he should be able to find the key to making the moves across the airy space. He spent 5-10min in the effort, never getting his second foot off the ledge, backing off several times as I sweated from my belay seat, expecting to take the full weight of the fall I imagined was just seconds away. I held the rope in a vise-like grip, trying to figure out how fast I could transistion from paying the rope out to stopping a fall on our 9.5mm rope wound through my belay device. I don't think I've ever been so nervous on a rope climb. It was with no small measure of relief that I was happy to see Robert take weight on the rope to move across to the footholds just over the gap. I knew he would be frustrated to some degree, but I didn't see how he was going to move across the vertical, holdless section without cratering. I find the 5.9 rating highly suspect - I watched Robert cruise up the difficult 5.9 finger cracks on HCS the day before, but this was a beast of another color. Robert surmised that the 5.9 rating might be for taller climbers with longer reach, which seems likely. Though I aided across it by grabbing the cord attached to the hanger, I was more easily able to reach the higher holds just beyond it when it was my turn. Robert continued traversing another 10-15ft to a small but stable stance before starting up on the improbable, exposed face. This section is quite steep but has decent holds. Robert worked up in smooth style, eventually disappearing out of view. Ten minutes later he'd set up a belay and brought me up to join him. I thought the exposed face climbing the most exhilarating of the route and was impressed with Robert's cool lead up it. At the top of P4 the route becomes class 3 and we both soloed the remaining sections in about 15min, though Robert seemed to seek out more challenging variations. It was just after noon when we reached the top with some rather incredible views overlooking the Valley. Robert celebrated by relieving his bladder off the north side before we settled down for a 20min break at the summit. HCS rises much higher to the southwest, with Higher and Middle Cathedral Rocks prominent to the west. Robert pointed out various routes on the features, some of which he'd climbed, before we noted a pair of climbers much lower on Middle Cathedral Rock making their way up the Direct North Buttress, a popular route on that feature. To the east is a fine view of the southside Valley features, including Sentinel Rock and Lost Brother. Naturally, El Capitan dominates the view to the north, but the Three Brothers are also shown in sharp profile. I found our descent to be equally exciting, taking five rappels in all to get back down to the start. The initial rap station is located at the top of the South by Southwest Route, about 50yds southwest of the summit. There are 5-6 glued stainless rings installed in a flat area nearby that are much more obvious and can be mistaken for the rap station, but they have no slings, no chains and are not easy to rappel from (one party on Mountain Project warned of the tremendous friction that needs to be overcome in pulling the rope). Robert thought that they had been installed for rescue purposes, but it seems they may in fact be for slacklining between the two spires. Robert found the correct rap station at the top of the imposing Southwest Face and we started down from there. Our 70m rope just worked for all the rappels - It wouldn't be advisable to use a single 60m rope. The first rap goes down to a wide ledge before dropping to a narrower one where a second rap station is located. This is where the excitement happens as the second rap ends at a hanging belay. With two of us strapped to a pair of bolts overlooking a lot of air, we had to pull the rope, feeding it through the next rap rings, then tie back into the rope one at a time to drop another 35m down the face. The fourth and fifth raps were less exciting, with one dropping from a tree and the other from slings around a granite block, both descending through somewhat brushy class 4-5 terrain to reach the talus below.